A nice bar where it is great to sit quietly on the weekend. It is a fairly small bar in the center. It has a large terrace that is heated in Winter. 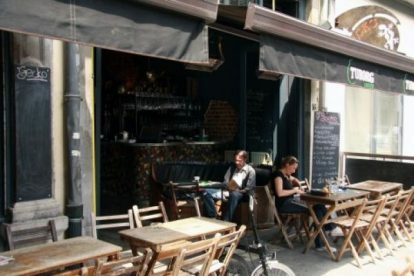 It is located near the trendy bars in Brussels not far from the Bourse. There is an 19th century warehouse (!) in front where you will regularly see tourists looking up in amazement. The service is quick because most people go to the other bars. You can have salads or a main course and they have a large selection of cocktails. Inside there is a small bar and a roomier setting where there are some tables.